I. Want. That. Make it so, Number One. …Happy Birthday Dear Blooo-aaahhgg, Happy Birthday Dear Blog! Yes, today is my blog’s first birthday. I bought it a cake knowing full well that it would just smash its chubby little hand into the frosting and shove fistfuls into its greedy little cheeks, so to save any mess that would ruin the cute little first birthday outfit I bought for my blog, I just ate the entire cake myself. It’s been a lot of fun and I have to say, I am mightily shocked that my blog lasted this long. My last potted plant didn’t make it for three months, and that damned thing was a cactus. You have to be talented to neglect a cactus to death. God invented cactus specifically for climates that like to neglect things until they die. The amazing thing is I still managed to have a career or two, a family, and even a couple of hobbies this year, and STILL write about stuff. Obviously, a lot of the stuff I got to laugh at involved my job, my family members, and my hobbies, but that’s a good thing. So what will next year bring for my blog? Well, I’m expecting it to have serious issues with the terrible twos, so by this time next year it will be completely unreadable. Unless it’s gifted. Oh, wouldn’t it be great if my blog was gifted? Then I could show pictures of it to people in line at the grocery store and bore them to death with stories about how talented it is, and they can’t get away because they haven’t paid for that bag of gummy bears yet but they already opened it and ate some. I do want to take this opportunity to say thanks for reading, because my blog wouldn’t have lived to see its first birthday if WordPress hadn’t kept convincing me all year that 47 people read it on a regular basis. Who am I to take the only source of joy in a bleak world away from all 47 of you? I’m like Florence Nightingale. Or Lady Gaga. I don’t know which. If you ever get that lady bug cake, save me a slice. 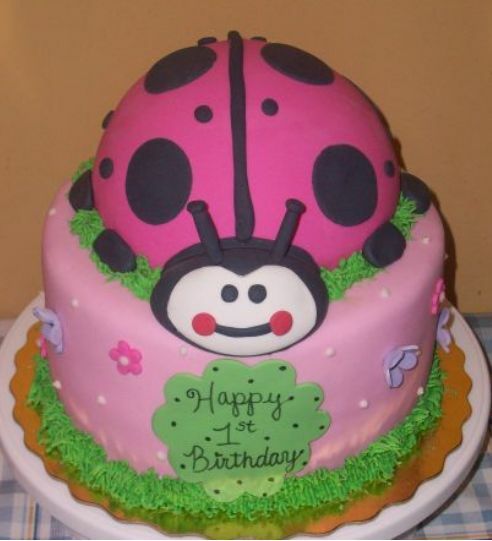 Was the Lady Bug made of real ones or just frosting? Just wondered if writing about eating bugs had tempted you to try it. Hooray for another year of Lorca stuff!! I love to read it. may your fan club grow and grow ( so you don’t feel that you are wasting your time just blogging to the 47 of us!). Woo Hoo! Thanks for blogging! Happy Birthday to your blog! May the next year be just as wonderful!